An easy recipe for Stuffed Portobello Mushrooms. 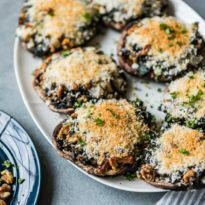 Makes a delicious vegetarian entree or perfect for anyone who loves mushrooms stuffed with spinach, walnuts, and Gorgonzola cheese! Adjust an oven rack to the upper-middle position and preheat oven to 500 degrees. Line rimmed baking sheet with parchment paper or foil for easy cleanup. Arrange 8 mushroom caps, gill-side down, on prepared baking sheet and brush with 2 tablespoons oil (set aside remaining 2 mushroom caps). Roast until tender, about 10 to 12 minutes. Remove mushrooms from oven, flip them gill side up, and sprinkle with salt and pepper. Meanwhile in a covered bowl, microwave spinach, water, and 1/4 teaspoon salt until wilted, about 2 minutes. Drain well and wrap in a clean kitchen towel. Squeeze to remove as much liquid as possible. Transfer to a cutting board and coarsely chop. Finely chop the 2 reserved mushroom caps. In a large skillet over medium-high heat, heat oil in remaining 2 tablespoons oil. Add onion and cook until softened, about 3 minutes. Stir in chopped mushrooms and cook until they release most of their liquid, about 4 minutes. Stir in garlic until fragrant, about 30 seconds. Stir in sherry and cook until absorbed, about 2 minutes. Stir in chopped spinach, Gorgonzola, and walnuts until heated through, about 1 minute. Season to taste with salt and pepper. Divide filling among roasted mushroom caps. Press down on the filling with the back of a spoon to flatten. Sprinkle with panko and drizzle with remaining 2 tablespoons olive oil. Bake until panko is golden and filling is heated through, about 2 to 4 minutes.